Ground Control TT levels and stabilizes the travel trailer in a matter of minutes and features hitch height memory. Ground Control® TT levels and stabilizes your travel trailer quickly and accurately. 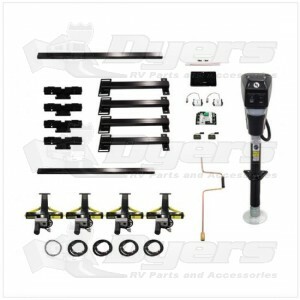 It's a long and difficult process to get an RV level with manual jacks, chocks and wedges. All new leveling jacks form a rigid triangle, the strongest shape in nature! With the push of a button, the Ground Control TT Leveling System levels and stabilizes a trailer quickly and accurately, enhancing the overall camping experience. It can take up to an hour to get a typical trailer leveled with manual leveling jacks, chocks and wedges. The Ground Control TT Leveling System saves the owner time by leveling and stabilizing the trailer in a matter of minutes. It also prevents annoying rocking and swaying of the trailer at the campsite. Under 3 minutes to level! Gross Vehicle Weight Rating (GVWR) of 10,000 lbs. All mounting hardware, wiring, brackets, and electrical components needed for aftermarket installation.